It is located on a rocky outcrop (Penya del Castellet) on the crest of the eastern arc of the Sierra Serella (1050 m). It has extensive views in all directions. To the north it overlooks the valley and village of of Castell de Castells, with glimpses of the sea in the distance; to the south the valley and village of Guadalest and the sea at Albir can be seen. 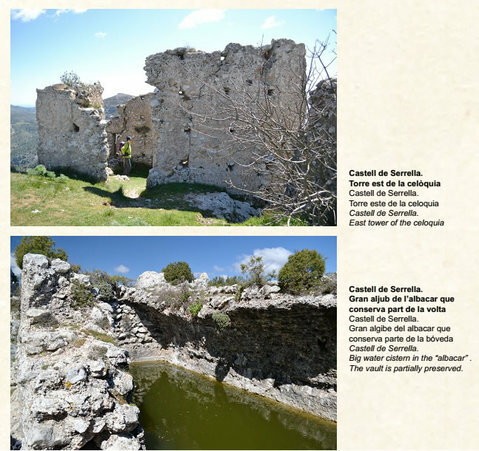 The bulk of the Serella mountain range runs westwards, and the sites of further Islamic remains can be seen, including the lookout of Pla de la Casa. Little is known of its early history, the first record of the castle was in the in the Treaty of the Well 1244-1245. 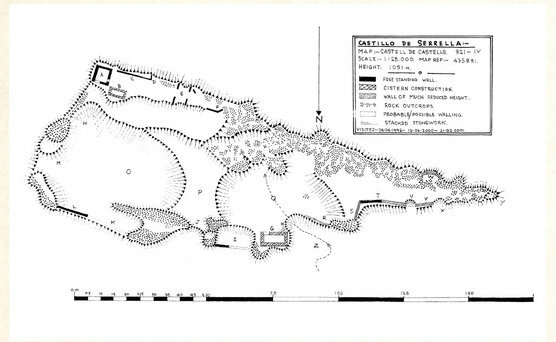 The fortification, which was named as Castell (Qastâl) and its associated lands, including various farmsteads such as d’Aialt, Bitla and Espelda was ceded to Al Azraq for his use for three years. It was taken by King Jaume in 1250 and abandoned soon after the Christian reconquest. which can be seen in sections. It has a well-preserved water cistern (G) which retains water to this day and is located next to the entrance to the enclosure.